Clients Think you Have an Agenda. So Have One! How often have you ended a meeting or a phone call knowing you didn’t cover the things you needed to? Perhaps you failed to communicate key concepts, or you didn’t leave enough time (and opportunity) to listen to the client? How valuable to your sales efforts would it be to say — implicitly – to your contacts: “I value your time and have invested time to make sure you get the most out of our appointment.” Setting an agenda at the beginning of every substantive phone call or meeting does just that. By proposing an agenda at the beginning, you will be able to start listening early in the selling process. And perhaps you can get an easy “yes” when you ask: “Does this cover all the things you’d like to cover?” You’ll also be telling the prospect that you have built in time to hear about their concerns, issues, suggestions, questions, etc. That way they can relax and concentrate on your pitch, knowing you’ll give them time to speak. Savvy sales people know that the first step of a sales conversation is achieving a rapport with their client or prospect. You can be business-like and personal by saying “I have prepared a quick agenda of what I think we need to cover, and I would like your reaction to it, but first, how are your kids?” That way, you can get the pleasantries out of the way without losing control of the conversation. 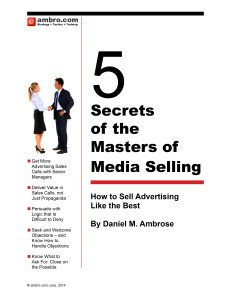 Read more Ad Sales Tips. Contact us for more information on training.